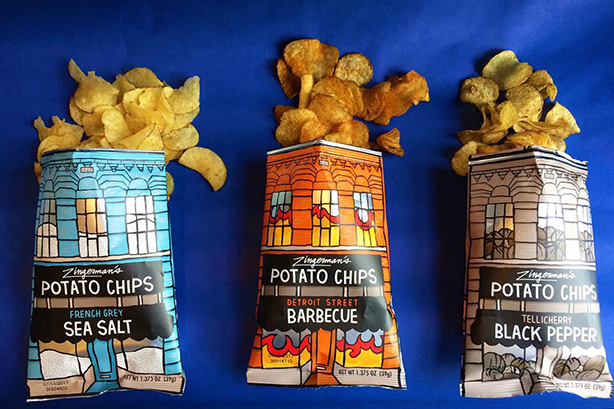 Yup, We Finally Did It: Introducing Zingerman’s Potato Chips! At last, we have our own chips! What took us so long? Quite honestly, we don’t know, but, we think the chips we’re now making—with the help of two great companies—were worth the wait. The project first began last year, almost by accident. The holiday months are traditionally the time when Co-Managing Partner and Deli Chef Rodger Bowser retreats to the kitchen. “It’s kind of nice,” he explains. “There are fewer meetings—and just less stuff to do—and October through December is my favorite time of year to cook because fall foods are the best.” It was during one of those sessions that he got the idea to make small batches of chips as a weekend special. He figured it’d be a good way to sample the Épices de Cru spices that the Deli sells. “We’ve been working with Épices de Cru for a long time. 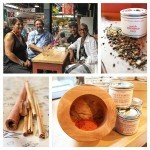 They’re very exciting, and their spices are exciting,” says Rodger. Not too surprisingly, the spices from the Montreal-based company, which sources their world-class products from all over the globe, tasted great on the freshly made chips. That got him thinking about making them a regular menu item, but the time and process required to make chips in-house on a daily basis didn’t seem feasible. When he mentioned the idea to Ari and fellow Managing Partners in the Zingerman’s Community of Businesses, his enthusiasm was matched. “We were off and running. Now I had to figure out how to get the product to market,” he says, laughing. He began testing different flavors with Great Lakes, sending them the Épices de Cru spices, which he felt were an absolute must for the chips he wanted to produce. They experimented with 20 different varieties over a few months and settled on three crowd-pleasers to start production: French Grey Sea Salt, Barbecue, and Tellicherry Black Pepper. 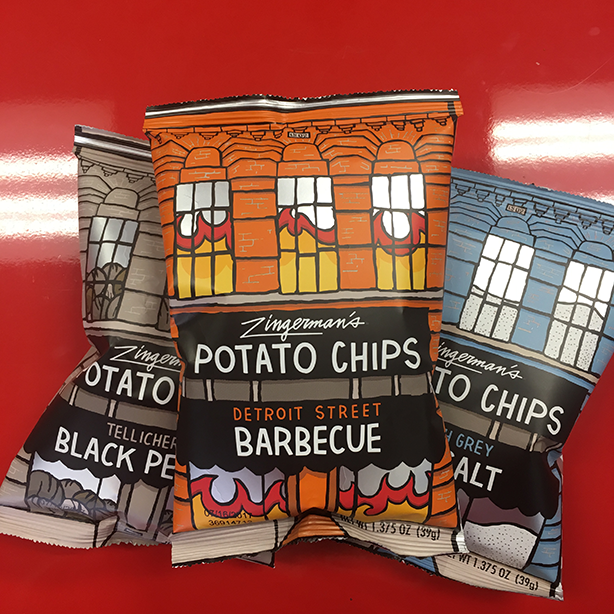 They discovered some unexpected flavors that worked well, too, and Rodger is planning a few special edition runs that could include Trinidad curry, Spanish paprika (he’s the most excited about this one) and maybe even a chip that tastes like Zingerman’s famous pickles. 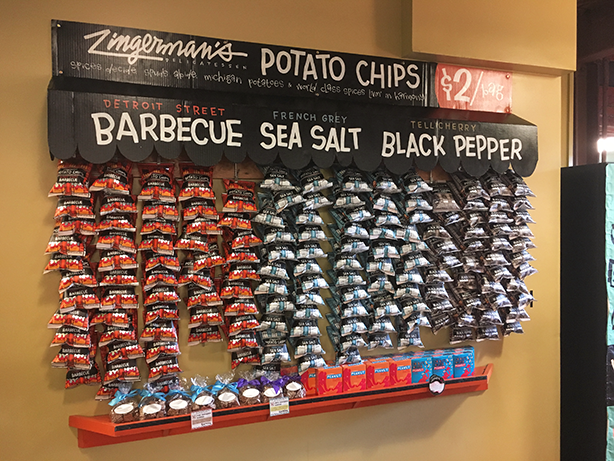 Zingerman’s Chips are available at the Deli, Bakehouse, and Roadhouse. 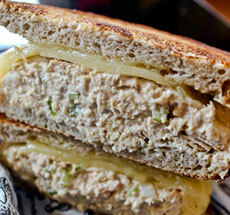 Also, you can get them in your Zingerman’s Catering Bag Lunches. «This Baker Just Took Her 200th Class at BAKE!